A citrus juicer is the cheapest to purchase, easiest to use and quickest to clean up so it’s a perfect way to start juicing. Great for making orange juice and can also be used with lemons and limes. 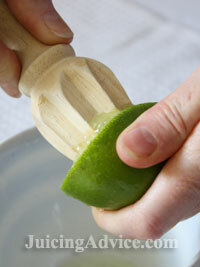 A manual citrus juicing tool is the simplest traditional juicer tool. 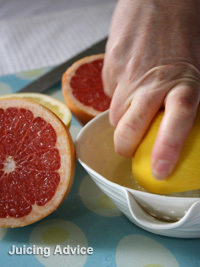 In the photos below you can see two of mine; the wooden hand held citrus juicer (left) and a ceramic version (right). Both of these juicing tools are easy to clean and small to store making them great for everyday use. The ceramic one was actually given to me as a wedding present. 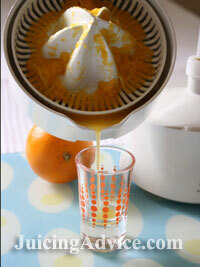 The electric citrus juicing machine does exactly the same job as a manual juicer but with just a little less effort. Below you can see a photo of my Braun juicer. Another great benefit of the electric juicer is it extracts the maximum amount of juice with the smallest amount of effort. This is a perfect tool for juicing lemons, oranges and limes. The Acme citrus juicing machine is a very similar, popular modern version of mine. 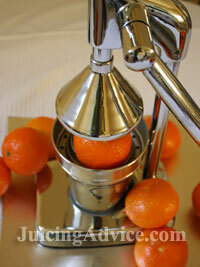 This trendy looking orange juicer seen in the photo on the right has become a popular worktop accessory. If I’m honest I thought it might be all looks and no substance so I wasn’t sure about purchasing one. However when I saw this one for sale in a local charity shop I couldn’t not give it a go. It really does work incredibly well. 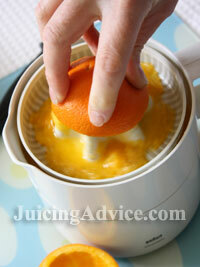 I was amazed about the amount of juice that this manual citrus juicer produced. If you want to boost your intake of vitaminC then citrus juicing is a perfect solution. Freshly squeezed orange juice makes a fabulous thirst quenching drink at any time of the day. I also love lemon and lime juice added to hot water and honey for a freshing hot drink during the winter. 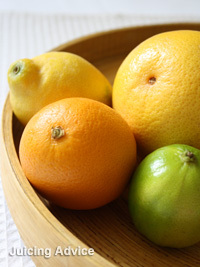 Citrus fruits are so readily available and inexpensive to purchase, another great reason to get juicing them.